kelbysews: Triangles and Squares Make Great Gifts! Triangles and Squares Make Great Gifts! I finished my triangle quilt! I forgot to get real pictures before I sent it off though! Doh! This is a gift for a good friend (I can't say who until she receives it!) I used an equilateral triangle ruler with a base of 6.5" unfinished to make the triangles. I quilted it with concentric circles using my walking foot and a bar guide. It stinks the first 2 or 3 circles when you're turning the whole quilt under your machine, but after that it gets really easy! For the backing I used an IKEA fabric that I adore! 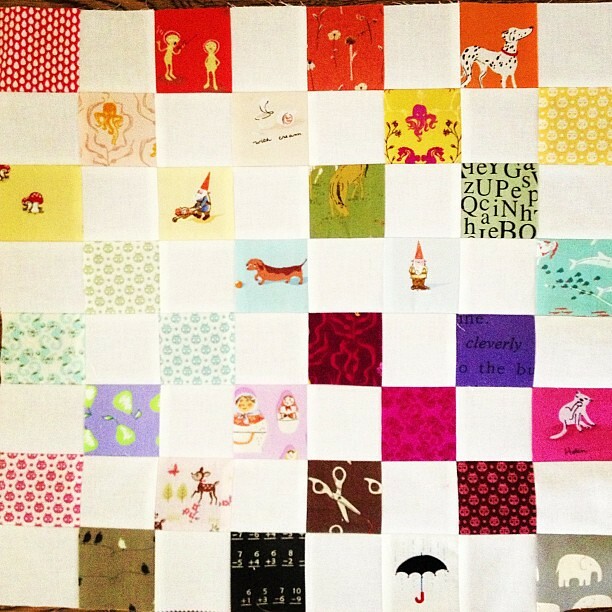 It's a bit wider than quilting cotton so I didn't have to piece the back! The quilt finished 50-something" by 60-something". I didn't take a real measurement, sorry! I don't have a great method for sewing triangles together. I'm more of the "better done than perfect" philosophy so sometimes the points look great and other times.....not so much. I don't really stress about perfection in my piecing--this is a hobby; it's supposed to be fun people! If I really want something perfect, I paper piece it! I started watching Vampire Diaries on Netflix (OMG! so many cuties in that show!) and decided to randomly fussy cut some squares to pass the time while I drooled over the actors. Of course it ended up a rainbow! I decided to make this into a pillow for my friend, Jessica, who recently moved to Portland. It seemed just her style and every new house needs some Heather Ross rainbow-goodness! 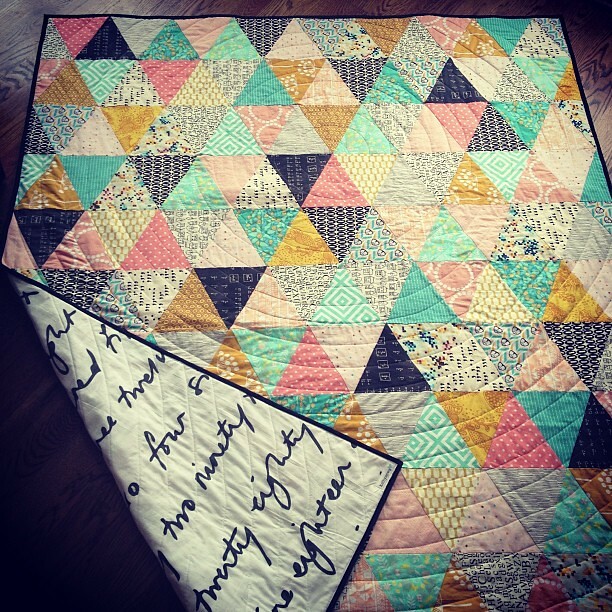 i love them both, but the colors you chose for the triangles quilt are just gorgeous. 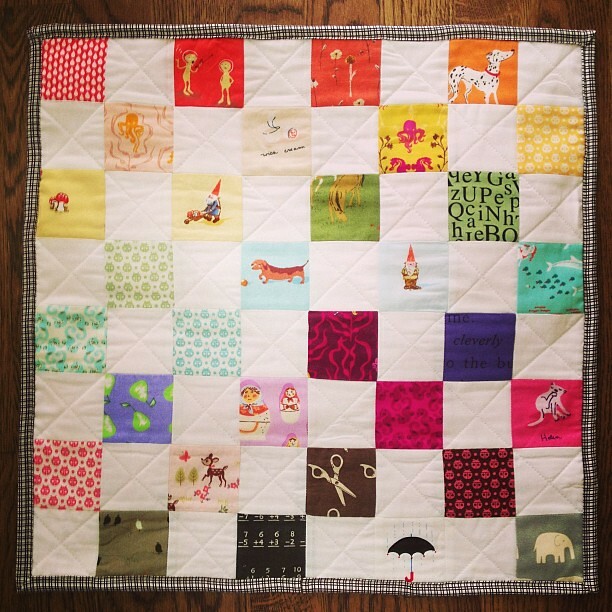 i really like the quilting too. That triangle quilt is one of my faces. And Vamp Diaries? You know how I feel about that. So glad you are getting sucked in, we have to chat and drool together. lol! Your probably in my top three favorite blog now... I love your style, your pictures always makes me wanna make a tone of projects. Your quilts are very nice, good job! great gifts indeed! The triangle person will love it... you're such a good friend! And the pillow is so cute too! Those are just TOOO cute for words! Love your fabric choices!!! i am totally with you on the "better done than perfect" philosophy for hobbies. only other quilters will notice mistakes; everyone else is amazed you can sew at all! love your project. i just got a triangle ruler, so i am a little nervous to hear that having the ruler doesn't mean all the pieces magically line up for you! Love your triangles! And the quilting is perfect! What a pretty triangle quilt! I like your "better done than perfect" slogan. So true! too crazy kelly! i just zipped thru the 3 seasons of vampire diaries on netflix myself. so much drammmmma! but yes...sugar sweet on the eyes!